Though I haven't read Eleanor and Park yet, I have readTwilight, and the thought of those two books meeting together sounded irresistible. Though it says in the synopsis this book is a contemporary romance, I still thought there was going to be a paranormal element like vampires to the story, but there isn't one. I was actually relieved there weren't vampires to be honest. 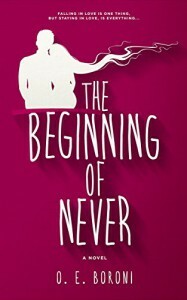 The Beginning of Never is a novel that may look and sound like it's a typical teenage tale of angst and woe, but that couldn't be farther from the truth. Rather, this novel is about working through pain, falling in love for the first time, dreaming of something better, and becoming who you want to be. The characters are realistic and have unique, individual voices, and I loved getting to know them. I'm drawn to characters who have lost a parent. It's something I have in common with them and am interested in reading how they deal with the loss. At the age of 14, I lost my mom to cancer, and it may seem strange, but I really like reading about characters who have that similar kind of pain to work through. I feel like I'm working through my own right alongside them. Lenora is angry. Very angry. I know what it's like to feel that way and not know what to do with any of it. Carrying all of that around is exhausting. She's been robbed of years with her mother, who died the day before Lenora's birthday three years ago. She doesn't handle her anger well, to say the least, and when her behavior becomes alarming, her dad sends her away to boarding school. There she meets Alex. Alex's middle name is Nathan, and that's how Lenora refers to him throughout the book, so I will here, too. Nathan is hot and cold with Lenora, and while I may have rolled my eyes a time or two, I couldn't help thinking some teenage boys really are like that. Their romance develops naturally with some bumps along the way. There's bound to be misunderstandings between two people, even those who seem to be the most in sync, and with Nathan not terribly outspoken about his emotions, it makes it even more likely Lenora would find his behavior difficult to decipher. At times I found his behavior difficult to decipher, too. I wanted The Beginning of Never to keep on going and never stop. The writing is superb, and the characters were so vividly brought to life, I felt like I really did know them. I love this book like I do a dear friend. This book does end on a cliffhanger, but not to fear - the next installment will be out really soon. And I can't WAIT to get my hands on a copy! !